Bangor, Maine (August 8, 2018) – New England Fights (NEF) will hold its next mixed-martial-arts event, "NEF 35: Wicked Season," on September 8 at the Cross Insurance Center in Bangor. Earlier today, the fight promotion announced the addition of a professional welterweight bout to the card. "The" Ryan Sanders (16-9) will face Armando "Big Chino" Montoya (10-6) at a fight weight of 170-pounds. The bout will be the third for Sanders in front of his hometown friends, family and fans. He is undefeated in the Queen City, where Sanders trains at Young's MMA. He scored a decision over Derrick Kennington (13-11) two years ago at "NEF Presents Dana White: Lookin' for a Fight" and a submission of Jay Ellis (15-78) last year at the Cross. Overall, Sanders is on a roll, having won six of his last seven. 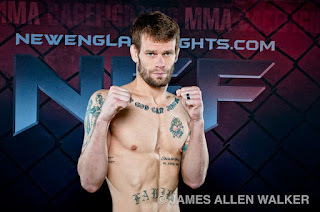 During that stretch, he captured the NEF Professional Lightweight Title, knocked out veteran John Ortolani (8-13) in a mere 15-seconds, and literally tore Vince McGuiness' (5-8) arm out of its socket earlier this summer at "NEF 34" in Portland, Maine. Unfortunately for Sanders, his meteoric rise to the top of New England's 155-pound division over the course of the last two years has come with consequences. He has called out virtually every other top lightweight prospect in the region in recent months with the sound of crickets as the only response. It is a testament to both Sanders' skill and the respect, (or fear for that matter), that his peers hold for him. Hence Sanders' move to the heavier welterweight division to find opponents willing to step in the cage across from him. "I am excited that I get another chance to fight in my backyard," said Sanders. "I appreciate Montoya for taking this fight because not many men are willing to fight me regionally. I look forward to displaying my ever evolving tool set come September 8 and getting another step closer to being the best in the world. It’ll be a great night for Young’s MMA and myself." Armando Montoya is a longtime veteran of the MMA cage. He started his professional career back in 2009 on the West Coast and has competed extensively throughout the Southwest over the years. Montoya has fought for national promotions like King of the Cage and the Resurrection Fighting Alliance. Recently, Montoya relocated to Maine where he trains with First Class MMA in Brunswick. The bout with Sanders will be his first fight back from a layoff that began in early 2017. "I'm excited to be fighting again after a year and a half off," said Montoya. "Thanks to NEF and Maine for the opportunity to be able to fight for an awesome promotion. Thanks to Sanders. It's exciting to fight a worthy opponent in September. God is good, God bless us all!" NEF's next mixed-martial-arts event, "NEF 35: Wicked Season," will see the company make its return to the Cross Insurance Center in Bangor, Maine. The event is scheduled to take place Saturday, September 8, 2018 with a bell time of 7 pm. Tickets are on sale now at www.CrossInsuranceCenter.com.